Discovering the secrets of Alsace is best done from the saddle of your bike. This border region, where the culture and cuisine of France and Germany merge is a great destination for cycling holidays. Romanesque and Baroque villages combine with undulating vineyard filled landscapes to form one of the most scenic regions of France. Cycle through the Heart of Alsace and enjoy this unique part of France or take a trip along the Wine Route and discover the wine of Alsace, exploring flavours you will not experience in any other wine region in France. Explore the best of Alsace by bike on this short cycling break to Alsace. 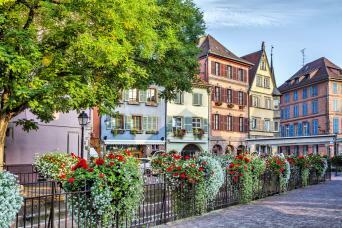 Based in Colmar you will explore Colmar, Strasbourg and the vineyards and villages of Alsace. Enjoy an inn to inn cycling holiday through the Alsace, staying in comfortable family run hotels. 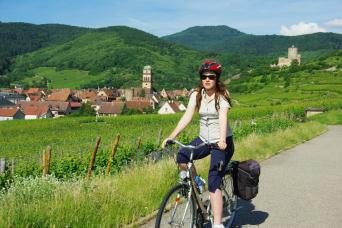 Discover Colmar, Strasbourg, Kayserberg as you cycle through the beautiful vineyards of Alsace.